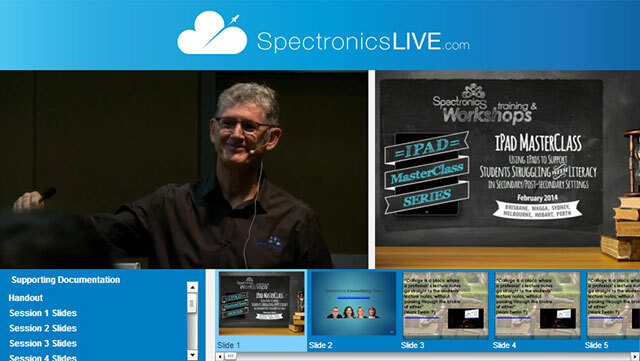 Now available to you as an Spectronics Online Premium Subscriber, a full day of video recorded live at the iPad MasterClass: Using iPads to Support Older Students Struggling with Literacy in Secondary School and Post-secondary Settings workshop in February 2014! Covering a range of individualised strategies and tools proven to be effective in supporting students who are struggling with literacy in secondary school or at Uni/TAFE/Polytech. Expertly guided by your presenter, Greg O’Connor, who has over 30 years of classroom teaching experience. Learn how apps like the popular Evernote support time management, note-taking, task completion and organised retrieval of researched materials. Consider alternative note-taking formats such as those offered by ClaroPDF. Explore improvements to your students’ reading comprehension and proofreading skills via text-to-speech apps such as iReadWrite and ClaroSpeak. Discuss the pros and cons of speech recognition on the iPad. See writing supports like word prediction within the Co:Writer and WriteOnline apps, come to life on the iPad. Tools previously only available on Windows and Mac computers. It is a rapidly changing playing field, which Greg will skilfully guide you through over the course of this inspiring day! The place for laptop-installed software and Google Chrome Extensions and apps which complement apps on the iPad, will also be discussed as part of an overall literacy toolkit critical for effectively supporting older struggling students. So many options to consider! Use this new video as your opportunity to attend this iPad MasterClass "virtually" via this recording of the full-day workshop. You will see all of the workshop’s presentation slides appearing along the bottom of the screen. If you wish to view the discussion around one particular slide or section of the presentation, just click on the slide you are after, and then click to play the video. The video will start at that point of the presentation day, and will continue from there. This video is also supported by handouts and presentations downloadable on this video page or as listed on the iPads for Literacy Support MasterClass Landing Page here.